I've added some fun new areas! Come check it out! Warning! 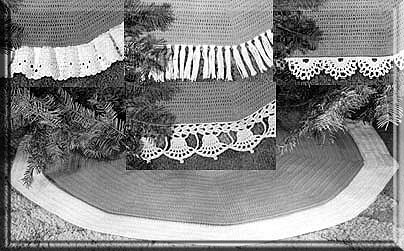 The pictures of the patterns are very large and may take some time to download - please be patient! Fun toys to fill with candy or small gifts. Adorable mothers fit over L'eggs containers; babies fit over small plastic eggs. 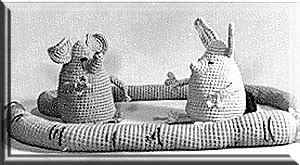 Or - they can be stuffed and sewn together for a soft toy. Either way - terrific for gifts or bazaars. All in 4-ply yarn. These 3 1/2" high cuddlies are eager to nestle in little hands, easter baskets and christmas socks. 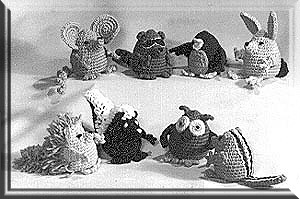 Pocket Animals set includes rabbit, mouse, raccoon and robin. Forest Freinds include skunk, chipmunk, owl & porcupine. Very popular for quick sales! In 4-ply yarn. These versatile 10" tall critters have 3-way personalities. Stuffed with polyfill, they are huggable pets. Stuffed with a rock, they are great door stops. Add the extra long tail to the mouse or the 3 foot carrot to the bunny and they keep cold breezes from beneath your door. Both animals on one pattern. 4-ply yarn. In England, they're called "draft-sausages" & have been guarding doors and windows for years. No matter where you live, you'll call them terrific! They also make fun toys. 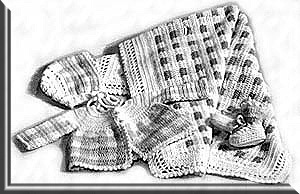 Both 4-ply designs included in one pattern. Love Gingham? Using 2 shades of color plus white, you can create this wardrobe - blanket, sweater, bonnet & booties - in pattern that duplicated woven gingham. Easy method avoids cutting yarn! Sizes - newborn to 6mos. 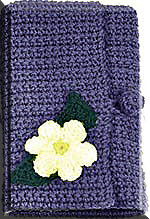 Beloved gift & unusual bazaar item; made of sport yarn. Assorted shapes, small enough for tiny fingers to grasp and little mouths to gum. All done in 4-ply yarn - use up your brightest bits of color. Something for the boys! Handsome sleeveless vest adds style and warmth. Precious on tiny guys worn over their little polo shirts!. Dresses up toddlers sizes 3 mos to 4 years. Made of sport yarn. Clever crochet method, when done with large wooden hook, creates afghans with a different color on each side! Using smaller hook, it makes a super-double-thick, no-holes, no-burn potholder. 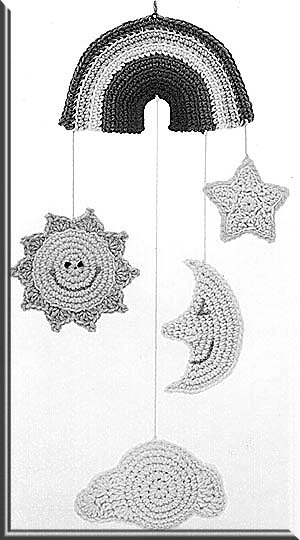 Instructions for 2 afghans, variations for potholder. Treat your family to this haunting Halloween hang-up. These fellows try hard to spook everyone but who can be frightened by those smiles? All in 4-ply yarn and easy single crochet.Each approx. 8" tall. Charlie has only 3 angles...I'll give you four! 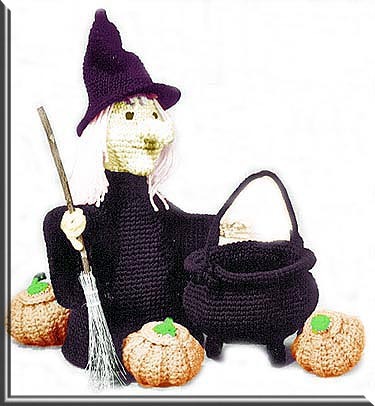 Complete instructions for each 5 1/2" to 6" adorable doll plus variations - all in 4-ply yarn. Use for ornaments, toys, bazaars, tray favors, gifts or friends. Perched over your sink, they listen well! Four original designs - tree, Santa face, Santa's hat and candle - to cover spare toilet paper rolls. Not just for the bathroom either! 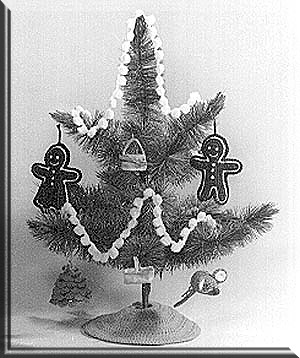 Make great centerpieces, gifts; tree is perfect for shut-in's room! 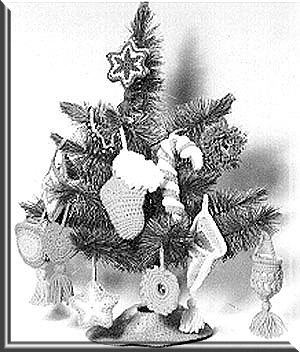 Terrific for bazaars.Tree in craft yarn - others in 4-ply. plus friendly mouse, tiny tree, popcorn chain and 3 star chains (not shown) all of 4-ply yarn. 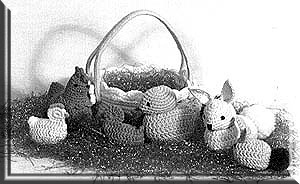 Also - 3 dainty baskets to make in cotton or yarn. 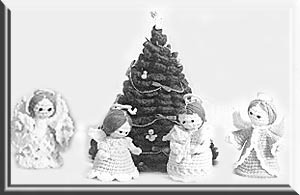 Imagine them on your tree; as toys; at bazaars; as nursing home tray favors! 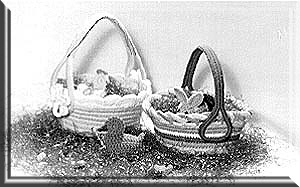 Use baskets at Easter, birthdays, showers! 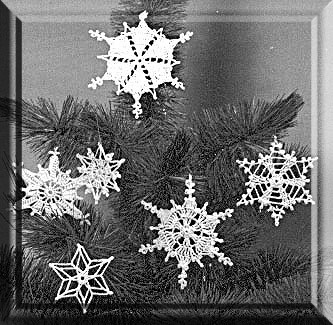 Create a small blizzard with these 10 different designs (6 shown - 4 more in pattern). Hang on tree, in windows, on a mobile; scatter across tablecloth; applique to party skirts, T-shirts, afghans and even on my #24 Tree Skirt! 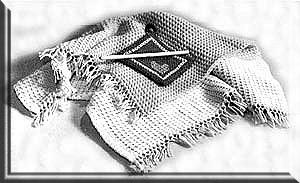 Made in cotton thread. 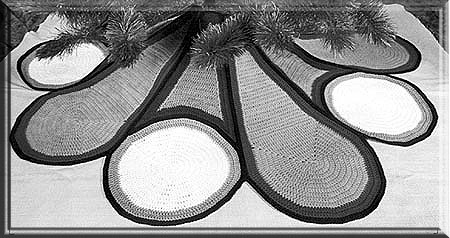 Shown are just a few of the 17 different tree trimmin's included in this pattern. All are quick and easy to work up in scraps of bright 4-ply yarn. Make loads for yourself and friends and don't forget the bazaar ... these sell like hot-cakes! A nice assortment of sizes, & styles to work up for ornaments, door & wall hangings, lapel pins & package trims. Use for Christmas, New Years, weddings, showers, any festive occasion all year 'round! 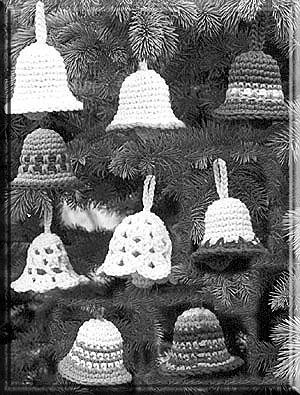 Different weights of yarn used for different sizes of bells. What a pretty way to brighten your table! 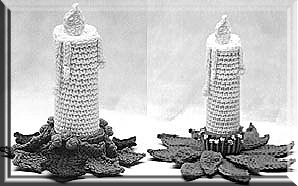 Here's a whole bouquet of flower candleholders. All candles fit over empty cardboard tubes. All in 4-ply yarn. (Gift container, Bank) Ingeneous, attractive way to have a light hand at all times. 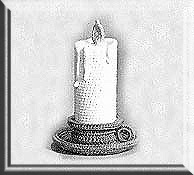 This large candle, worked in 4-ply yarn, covers an empty pringles potato chip can which is just the right size to hold a flashlight or to stash some cash or fill with a small gift! Really neat for stacks of cookies - make mine chocolate chip! Little egg-hunters will love these. So will you because they're washable, non-breakable, reusable & such fun to make of 4-ply yarn.Two styles - each approx. 8" x 3 1/2". P.S. You may want to steal 'em for your own use. 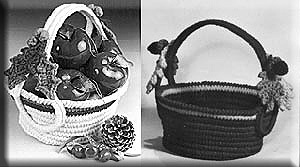 Two more lovely baskets for you to make in 4-ply yarn! One is trimmed with oak leaves and acorns; the other with holly. Fill their ample 8" x 3 1/2" interiors with cookies, nuts, polished apples, greeting cards. Give them as gifts or use as gift containers! 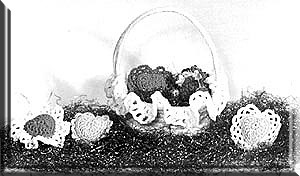 Crochet this frilly edged basket & fill it full of plump little hearts (embroidered & scented if you choose). 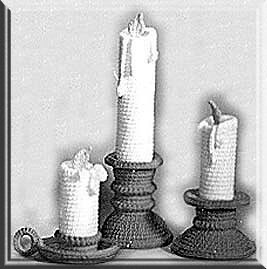 Lovely centerpiece lets your family know you cared the very most! 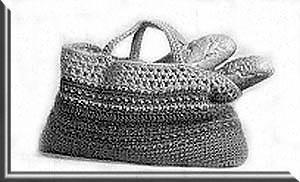 Basket approx. 8" across x 3 1/2" deep. All in 4-plyyarn. At last! One perfect place for all your tools! 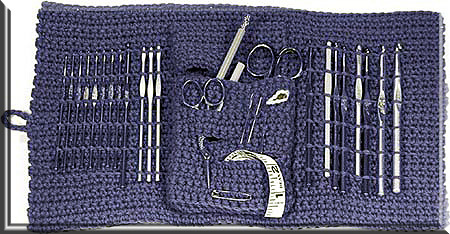 Hooks, scissors, pins, needles, gauges, rulers... everything needed while crocheting can be stashed here. Folds up like a small purse...drapes handily over arm of chair! Uses 4-ply yarn. What fun! 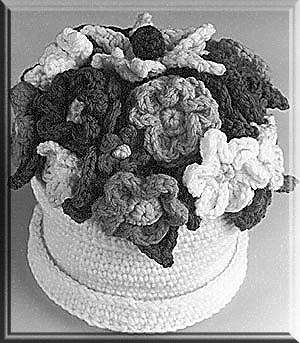 A flower pot, complete with saucer,overflowing with a bright bouquet of 6 different blossoms - all in 4-ply yarn. Slip it over your spare roll of toilet paper - handy in the bath - cheerful in any room in the house. For a "custom" look make a matching towel ring.